One of the reasons for this decline is the growth in mobile users. Ads are more difficult propositions at the smaller size and are accordingly even less expensive than their desktop equivalents. And more mobile (at lower CPCs) means less desktops (at higher CPCs). Then there’s the rise of social media. Your friends, colleagues and family — the most effective of all advertising media — are all using their favorite network to collect thousands of people, each multiplied by six degrees. And all these people are now too busy interacting with one another on Facebook or LinkedIn to bother with anyone’s ads whether they be online, print, radio or TV. Ads are essentially passé. Okay, enough with the bad news already: Where’s the opportunity in all this? It’s not easy, but it isn’t rocket science either. If you want some help, this video is a mini-course (43 minutes) on how to create the right content for your ideal prospects. It includes help on how using content to power inbound marketing and marketing and sales automation. If you do provide great content and get the message out to the right people, they will visit your site, explore it by consuming your content, buy your products and services, and tell their friends. 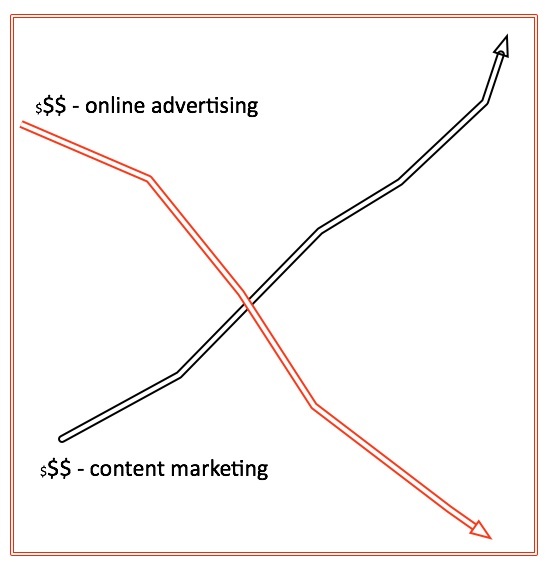 Content marketing is an expensive proposition. It takes serious thought (always an expensive commodity), time (precious stuff), and a fair amount of talent — or, at minimum expertise with access to talent — (yet more time and money). But think of it this way: A good bit of content has a shelf life of years and the cost per click when it’s housed on your site is almost zero (the cost of your site across all it does). Even better, one great blog post can be turned into a video, a white paper and a tutorial. I believe there is little choice in the matter. And when you’ve created a content inventory that you can reuse and repurpose, the costs will drop. When you’ve gained some experience at doing it all, it will become easier, too. Eric Goldman is the President and Founder of Gossamar, a business designed to help people grow their businesses profitably and with predictable, planned success. He has been involved in B2B Marketing and Selling for more than 30 years and his business acumen covers 5 continents, spans many countries and has been derived in a variety of markets and industries.